Need advice about a specific BMW 2-Series problem? See TSBs and recalls for the 2016 BMW 2-Series. 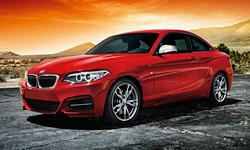 See repairs for all BMW 2-Series model years. 5000 mi drivers seat belt jammed in door post bracket. 7000 mi Loud knocking sound when cold. Dealer says it's normal but can't show me another car on the lot with a N55 engine that has the same issue. Next oil change I'm going to try a different dealer and have them evaluate the knocking sound again. 3000 mi Electronic waste gate malfunction. 11000 mi Convertible roof was repaired. The inner liner had caught and torn in the linkage/folding mechanism for the convertible roof. The inner liner was replaced under recall. 12000 mi BMW Assist (SOS function) error light came on. The dealer rebooted the system and the problem has gone away. 26000 mi The front brakes began to squeal and would not stop. The dealer said this was actually something BMW had identified in a service bulletin. See our lemon odds and nada odds page to see vehicles with no repairs or vehicles with more than three repairs. To see how frequently 2016 BMW 2-Series problems occur, check out our car reliability stats.